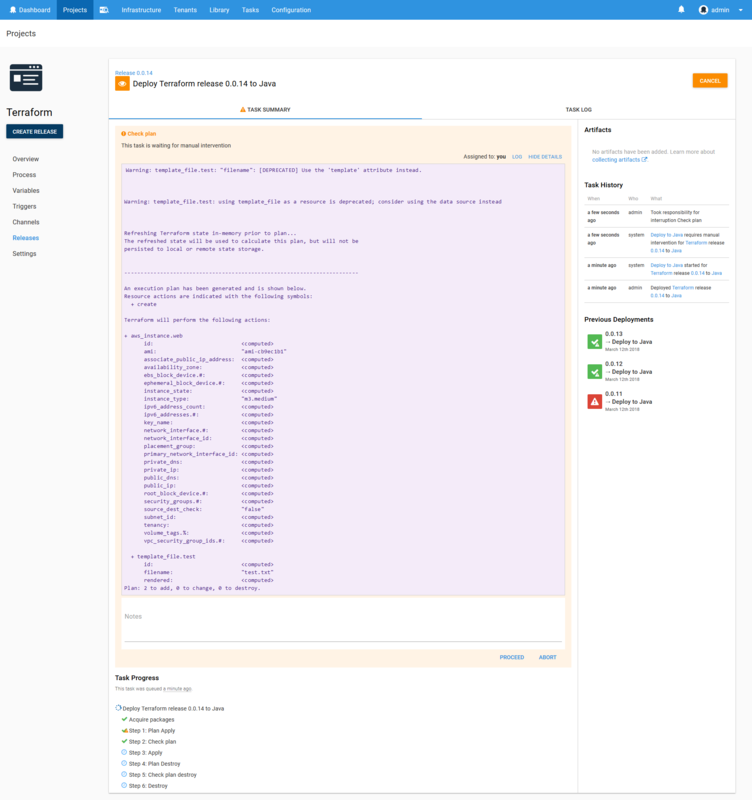 The Terraform plan command is used to identify changes that would be executed if a template was applied or destroyed. This information is useful to confirm the intended changes before they are executed. 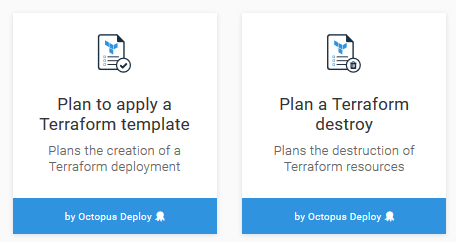 Octopus has two steps that generate plan information: Plan to apply a Terraform template and Plan a Terraform destroy. As their names suggest, Plan to apply a Terraform template will generate a plan for the result of running apply on the template, while Plan a Terraform destroy will generate a plan for the result of running destroy on the template. The options for the planning steps are the same as those that are specified for the Apply a Terraform template and Destroy Terraform resources steps. You can refer to the documentation for those steps for more details on the options for the plan steps. The plan steps do not support saving the plan to a file and applying that file at a later date. This means the plan information only makes sense when the same values are used in the plan and apply/destroy steps. Configuring shared variables for the step fields ensures that the same values will be used. This log message indicates the output variable that was created with the plan text (the name of the step, Plan Apply in this case, will reflect the name you assigned to the plan step). Typically the result of a plan will be displayed in a Manual Intervention step. Because the plan text can contain markdown characters, the variable should be wrapped up in back ticks to display it verbatim. 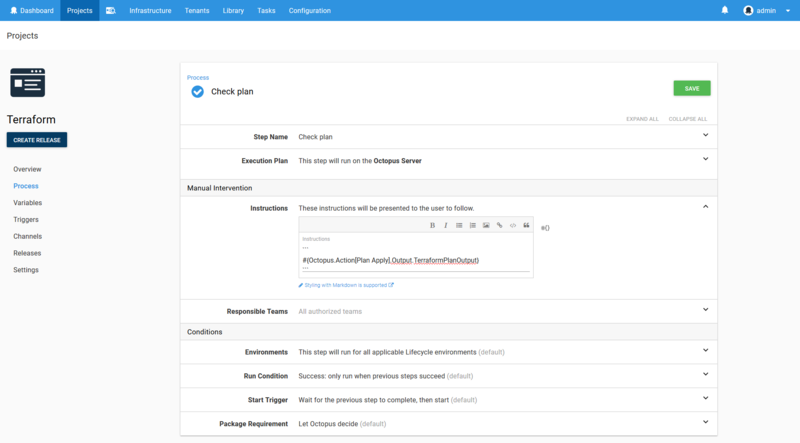 When run as part of a deployment, the plan output will be displayed like the image below. Setting the variable Octopus.Action.Terraform.CustomTerraformExecutable to the absolute path of a custom Terraform executable will result in the step using that executable instead of the one shipped with Octopus. You can use this variable to force the Terraform steps to use a specific version of Terraform, or to use the x64 version if you wish. For example, setting Octopus.Action.Terraform.CustomTerraformExecutable to C:\Apps\terraform.exe will cause the steps to execute C:\Apps\terraform.exe rather than the built in copy of Terraform.